Boxing Day - Black Park "Pinewood Trail" from 09:30, LBH stalwart Francis Thomason regular 3.3 handicap mile run at Hammersmith on the last Tuesday of the month with starts staggered to try to get a mass finish at 1 p.m.
Thursday 28th - run off the turkey and stuffing with Neil's round the airport run - meet in Moor Lane at 12:00. (see last week's digest for more details and let Neil know to expect you: Neil Frediani). Saturday 30th - Regular parkrun day. New Year's Eve - I bet there are lots of races organised. New Year's Day - still time to plan your New Year's Day double parkrun - see Google map of New Year's Day parkruns for options and ideas. After 28 years of the Winter Solstice/Christmas Parkway Mile in Cranford the traditional midwinter event shifted rather nearer the “new” corporate HQ building in Harmondsworth. The longevity of this venue will be closely linked with the pending decision on LHR expansion and the next decade could be interesting. The out-and-back relay format with Harry Wild at the turnaround point has been retained with the start and finish now in Bath Road, Longford. The start/finish point is a signpost opposite the Premier Inn (close to the refurbished Longford Pump) and is already used to mark the end of the now well established “Dream Mile”. The turnaround point is a stout tree opposite the Atlas statue at the Compass Centre. The weather for the event was much more pleasant than that experienced in the preceding days. Overcast but dry, mild and calm. The nine runners were divided into three teams of three. Running order was left to the team members to decide between themselves. Runners had been conservative when estimating their times for a new and what is probably quite a fast and definitely flat course. Nobody took longer than predicted and some performed a lot better than expected. Simon Turton (David’s City Striders) led off and came back for the first changeover in 6:20 to establish a course record which lasted for all of a quarter of an hour! Chris Kelly (Jordan River Tri Club) running the anchor leg for his team found he had too much to do to close the gap on the runners in front but set a course record of 6:13 to carry forward to a future occasion. Alan Anderson and Steve Newell were the timekeepers with Harry Wild at half way and Alice and John Banks cheering the runners in at the finish. All the runners and a significantly larger number of non-runners then retired to the Five Bells in Harmondsworth for a pleasant evening which included a generous buffet, Santa’s Sack ritual and swapping of Christmas Cards. Ed: I counted 35 of us there - not a bad turnout at all. I trust that the person who received a 2017 diary as their Santa's Sack present understands the situation and returns it next year. Roderick adds - Steve had the difficult task of assigning the runners who turned up at the start into three roughly equal teams. Very difficult when you don't know who is going to turn up and you don't know what form each person is in. We ended up with three teams that finished within 67 seconds of each other. A retrospective analysis showed that the worst three teams would have been Chris, Simon and Barry / Graham, Piers and Neil / Trish Roderick and Steve. Those teams would have had a five minute 48 second spread! The best, retrospective, team selection would have been Chris, Graham and Steve / Simon, Neil and Roderick / Barry, Piers and Trish. Those three teams could have finished with times of 21:55, 21:54 and 21:49. Except of course that the first two teams would have used each other to catch the third and all would have finished faster! Just wanted to record my thanks to the committee for staging the mile relay and Xmas social in Harmondsworth last night. It’s not been easy finding alternative venues for both traditional races and socials but last night ticked all the boxes and I’m sure I’m not alone in very much appreciating the subsidised buffet in the convivial and historic setting of the Five Bells; I’m pleased it was so well supported by the Club. Merry Christmas and a Happy New Year. Andy Rayner also says Merry Christmas to all and I've also heard from others who were unable to make it such as Steve Taylor, Joe Nolan and Steven Norris over the last week AND I've met up with and spoken with Brian Forrester and all pass on their best wishes. Adrian Haines (18:06, 81.49%) returned from his triumph in the KLM Netherlands sand dunes race to be second across the line at Tilgate. His pb there remains at 17:52. WARR team member Jude Carter-Murphy (20:57) achieved a course pb at Crissy Fields in San Francisco. He normally runs at Netley Abbey where he ran a pb of 20:04 earlier the month. Roderick adds: "Not (yet) a member of the club Jude's time at Crissy Field was just six seconds slower than that of club record holder Gary Rushmer (20:51). All of the club parkrun records can be found on the club map (as well as on Steve's parkrun stats spreadsheet)". Sarah Gordon (37:13) tried one of the newer parkruns in the West Midlands at Sandwell Valley in West Bromwich. There is some serious climbing involved and the route crosses the M5 motorway twice. No dogs or buggies. Handy for the Hawthorns. That moves the BA parks total on to 374. Astonishingly the most travelled individual (Paul Freyne) is well ahead of us on 388 and second placed Paul Fielding is on 371 and routinely clocking a new one every week. Nobody else is over 300 yet. Roderick Hoffman (27:39) is 20th= on 214 after his run at Southampton this week. 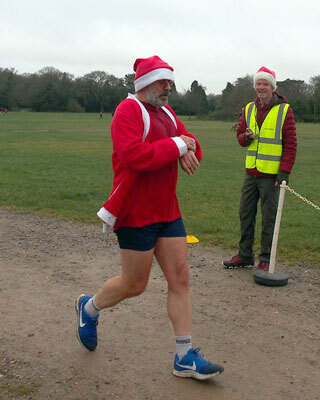 Parkrun rounder Paul Sinton-Hewitt (23:29) made one of his occasional appearances at Gunnersbury Park to check on Alan Anderson (34:39) who returned to action after a two-week break. Alan is now on 486 runs and could reach 500 sometime in March. We’ll keep you posted. Southampton parkrun often has the second biggest UK attendance. Saturday's 682 was impressive but only high enough for fourth place after the regulars of Bushy (1270) and Poole (733) and also Exmouth with 710. You probably didn't know that Exmouth had a parkrun - well they didn't until Saturday but now they do and their inaugural had the highest inaugural attendance of all UK parkruns. There was a popular misconception that huge parkrun inaugural attendances are generated by uber tourists like me flooding a small venue by the train and coachload. I've been conducting analysis of recent parkrun inaugurals and the conclusion is clear that large crowds are from the immediate locality - fewer than 9% of Exmouth's attendees, just 60 or so, have home parkruns further than 18 miles away from Exmouth. Another new UK parkrun made the news this week - this one starting on 20th January will not, I predict, attract hundreds of tourists and if they did arrive it would be by the boatload - Bressay parkrun on Shetland. Not only do you have to travel to the main island on Shetland but you then need to get on a ferry to take you to Bressey. The parkrun will start from near the pier shortly after the 9:30 arriving ferry docks. Oh, and a second prison parkrun is also starting up - another one difficult for parkrun tourists. Trish reported a few week's ago that she had completed her 1,000 mile running target for the current year. I've also exceeded my 1,000 mile target - currently on 1140. I also know that Neil is planning a mega run for New Year's Eve to meet or beat his 1,000 mile target. Do one of the Street-Orienteering runs I go on about. The above is my target for the FIRST nine days of January - including the Berlin parkrun on January 6th and the Street-O event on January 9th is in Richmond. But what are your targets? Email me and I'll publish them in the digest...once in print you know that they have to happen!